Architect - Shumake Architecture P.A. Another recent project completed in November 2018 by Seco South was Smiley Hall located on the University of Tampa campus. Smiley Hall is one of University of Tampa’s “traditional” residence halls. Crossroads Construction was contracted to renovate the hall and invited Seco South to participate in the renovation. This project required removal of the existing railing system and an all new stainless steel railing system to be installed. 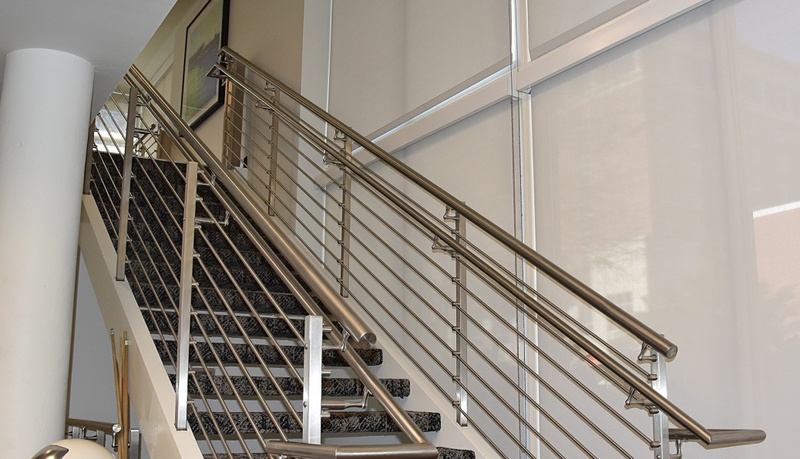 The new stainless steel railing consisted of approximately 220 linear ft. It included 5 stairs and an interior mezzanine. The design of the railing system chosen was our RB1-2000 which included 1 ½ “ square vertical post, a 2” diameter top cap, and a 1 ½ “diameter hand grab. The infill for this system is a horizontal bar design using a ½ “ diameter round bar which passed through a decorative bar holder attached to each vertical post. The finish on the stainless steel was a no. 3 brushed satin.